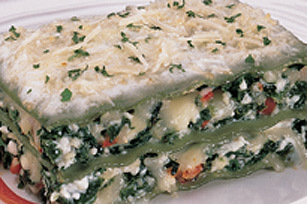 Spinach lasagna with spinach, 3 cheeses and a creamy white sauce. Combine ricotta cheese, spinach, eggs, and red pepper. Season to taste. Melt butter in saucepan over medium heat; cook onion and garlic 2 to 3 minutes. Stir in flour, then milk. Cook and stir until bubbling and thickened. Stir in 1/2 of the Parmesan cheese. Pour 1/2 cup sauce over bottom of greased 13x9x2-inch baking pan. Top with 1 layer of 4 lasagna noodles, overlapping edges slightly. Layer with 1/2 spinach mixture, and 1/2 of the mozzarella cheese. Repeat layers. Top with last 4 noodles. Pour remaining sauce evenly over lasagna; sprinkle with remaining Parmesan cheese. Bake in 350°F oven for 35 minutes. Let stand 10 minutes before serving. Prepare ricotta spinach mixture and white sauce in advance. Assemble lasagna just before baking. Excellent source vitamin A and calcium, good source B-vitamins and moderate dietary fibre!